Harriet joined the practice in 2012 as an out of hours’ receptionist. 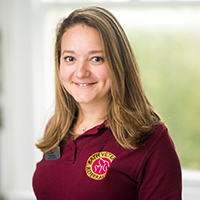 Harriet became referral administrator in 2013 where her main role is to liaise with referring practices and their clients to arrange referral appointments. Outside of work she enjoys going on long walks with her Doberman Ernie and enjoys keeping fit.